Des is irritated by Julie. Daphne approaches an outhouse, having heard a noise. Daphne opens the door of the outhouse and a girl runs out. Daphne chases her and catches her. She demands to know who she is. She tells her angrily that she's scared her to death and she'd better tell her who she is. The girl looks suspiciously like the lead actress of The Henderson Kids, but I digress. The girl is very unpleasant and taunts Daphne a bit. Daphne says she'd better get some answers or she'll call the police. The girls laughs that she scared Daphne. Max is bemoaning the fact that he can't meet any women. SHANE: You'll just have to learn to go with the flow. MAX: That's what I tell all me customers! Shane says that Max will have to start socialising with women. Shane says that Daphne suits him for now, but he wants to play the field. Max says he misses Maria. Daphne has made her and Rachel a cup of tea. Rachel is very reticent but eventually tells Daphne that her surname is Burns - her father owns the house. But her parents are divorced and she went to live with her mother and new stepdad, who she hates. So she came here to hide out. She didn't know that Daphne would be there. Daphne believes her, but still doesn't approve. Rachel shouts that she wants to be with her father and this is her home. Daphne says that Rachel's mother must be worried sick. Rachel says that her mother called one day when Daphne was out. She put on an adult voice and told her mother that her father had moved. Daphne picks up the phone to call Rachel's mother. Rachel says that her mother doesn't care - if she did she'd have found her by now. Daphne says she can't take responsibility for Rachel without her mother knowing where she is. Rachel says if she does, she'll ring the estate agent and tell Daphne that she had a man staying over. Daphne is angry. Rachel is fifteen, but Daphne doesn't think she acts it. Daphne says Rachel can stay for a while. She'll give her a chance to sort things out. But there'll be a few conditions - like Rachel has to tell her where she is at all times. Rachel protests, but Daphne says that Rachel is now her responsibility. Also she wants to know where she can contact Rachel's mother - she'll only call her if she has to. Daphne won't play blackmail like Rachel did. Daphne says they might get on alright now they understand each other. Shane comes round and Daphne isn't pleased at his lateness. He says he's been giving a friend Liz a driving lesson. Daphne isn't pleased that he's been out with another woman. Just then, Rachel comes in, much to Shane's surprise. Daphne introduces them and explains the situation. She says Rachel is a sort of friend of the family. They sit down to dinner. 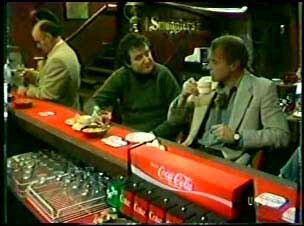 Jim and Max are having a drink. They admit they are both a bit lonely without female company. Max tells Jim about Amy being the size of a house now. 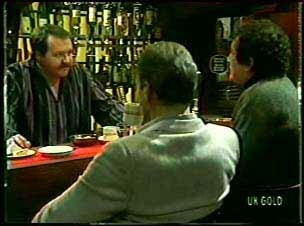 Jack the barman comes up and tells Max off - a beautiful-looking lady came in to see Max. Suddenly Max realises that there was a mixup. Rachel has been rude to Shane and he's not very happy. Daphne tells Rachel off for her actions and make her help to wash up. Daphne says there's going to be a roster from tomorrow. She warns Rachel not to play dirty because Daphne can play even dirtier. Rachel stomps off to her room. Shane can't understand why Daphne doesn't send Rachel home. Daphne says that the rudeness and aggression is only a cover for a confused girl. Jim tells Max to ring Amy and explain. They all laugh about the situation. Max goes to ring Amy from the payphone. Max comes back and says that Amy hung up on him(!) Jim tells Max to give him the number - he'll ring Amy tomorrow. Eileen has bought Des some clothes to cheer him up after Joan. She says that perhaps if Des weren't so kind and understanding, women wouldn't walk all over him(!) Des says that they don't - they walk away from him. They start talking about Des's father. Eileen says that Malcolm used to tell her what to do but then Des came along and that put an end to that(!) Eileen shudders and says, "Nasty habits!" She says she still did everything for Malcolm - "except that"! DES: I've given up women. I think I'll just play the field. EILEEN: Yes, an electric blanket is safer and cheaper! Des tells Eileen that his father asked Des to go with him when he left. But he's not sorry he didn't. Well, sometimes he is, he really missed him when he was growing up. But he's glad Eileen is there, especially now. Des says the worst thing when you're depressed is to be on your own. He says that at least Terry still lives there. Eileen points out that Terry is marrying Paul soon. She says that noone cares like family does. Des says that Daphne cares, and he's got heaps of friends. Eileen says she'll stay on with Des until he feels better. Des tries to put her off, but fails. EILEEN: I'll move back in with you. And we'll weather life together!